Opel is at the right PACE! talks about the progress and challenges of its implementation. 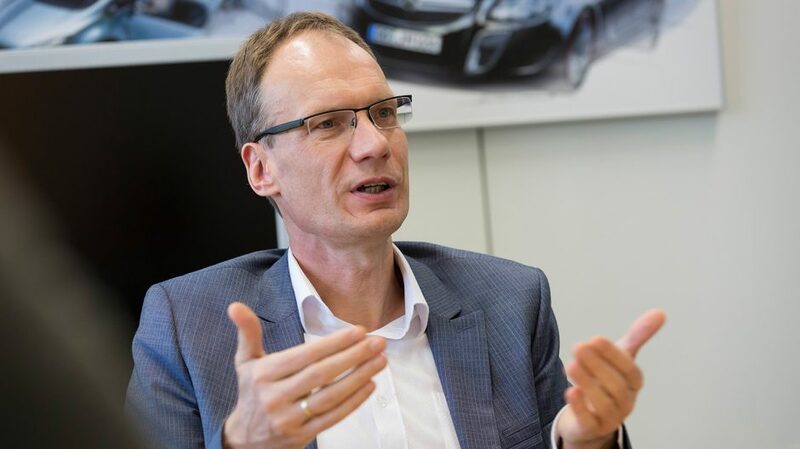 Opel Post: Mr. Lohscheller, our turnaround plan PACE! has now been under execution for six months. How is its implementation progressing? Michael Lohscheller: We are making good progress and are moving rapidly. We presented PACE! on November 9 last year only 100 days after the merger. And we then immediately started with its implementation. The three main goals are clear: Opel goes profitable, electric and global. Opel Post: An important aspect from the very beginning was to significantly improve the competitiveness of the plants across Europe. Where do we stand with this? Lohscheller: Within a short time, we created the prerequisite for the future of most of the sites: competitiveness. Thus we could confirm products and invest. From 2019, we will manufacture the multiple award-winning PureTech three-cylinder turbo petrol engine in Tychy (Poland) and Szentgotthárd (Hungary). Introducing petrol engines in our plants is in line with the shift of customer preferences from diesel to petrol. We are investing in Aspern (Austria) to produce higher volumes of the MB6 six-speed manual gearbox there. Thanks to a social framework agreement that has strongly contributed to bringing the manufacturing site to the right level of performance, we were able to allocate production of the new Corsa to our Spanish plant in Zaragoza. The electric Corsa will also be produced there from 2020. This will make the plant our first to produce a purely electric Opel in Europe. We have also reached agreements with all stakeholders at our British plants in Ellesmere Port and Luton. We will build light commercial vehicles on the Groupe PSA EMP2 platform in Luton in the future. This means that we will produce Peugeot and Citroën models there alongside the Opel/Vauxhall vehicles. This is a milestone for the future of the plant and a key condition for achieving our major goals in this important market segment where Groupe PSA has a strong leadership in Europe. These decisions clearly show that our PACE! plan is being implemented throughout Europe. It is also a clear acknowledgement of our skilled employees. Opel Post: And this doesn’t apply to our German locations? Lohscheller: We are an iconic German brand with a rich tradition. Germany is and remains our backbone. We employ more than half of our European workforce in our home country. Of course we also want to invest in Eisenach, Kaiserslautern and Rüsselsheim and we respect the collective tariff agreements in all production plants. Opel Post: What are the plans for Eisenach? Lohscheller: The plan for the Eisenach plant foresees production of an SUV as of next year already. From 2020, a second variant – a hybrid model – could follow in Eisenach. Unfortunately this investment ultimately couldn’t be unleashed so far, because we didn’t meet the necessary conditions for competitiveness. The sooner we reach an agreement, the better for Eisenach and all our sites. Opel Post: What is planned for Kaiserslautern and Rüsselsheim? Lohscheller: We are also offering projects and capacity utilisation for the Kaiserslautern plant, which extend beyond the duration of the current collective agreement. In Rüsselsheim, the company plans to launch a vehicle in the D segment based on the Groupe PSA EMP2 platform. Opel Post: What does the future hold for our fourth German site, the parts distribution centre in Bochum? Lohscheller: We also comply with the applicable collective agreements in Bochum. The parts distribution center in Bochum will also in the future play an important role in our European distribution network. Of course we also have to improve our competitiveness in Bochum. Opel Post: So is PACE! mainly focused on the sites when it comes to improved competitiveness? Lohscheller: The plants are obviously very important but PACE! is much more comprehensive. We are leaving no stone unturned. They are several levers to activate. Reduce complexity and costs, increase productivity and competitiveness – that is the name of the game. Please always keep in mind – our company has been recording losses for almost 20 years! The status quo is Opel’s fiercest enemy. We have to solidly and steadfastly reposition ourselves. So we have been going full speed ahead with PACE! from the very beginning! Opel Post: Did you maybe overstep the mark at times such as with the severance offers, which the works council opposed recently? With this intermediate step, we are able to respect the willingness of the about 400 employees who have decided to take another career opportunity outside Opel. For those with a voluntary departure date after May 31, we expect to find fair solutions in the interest of both the employees and the company. Interested employees should continue to contact the personnel department for the voluntary programme. The speed bonus is – as communicated – offered until May 21. Of course, both the programmes for partial retirement and senior leave also remain valid and unchanged. Michael Lohscheller, Chief Executive Officer (CEO) of Opel Automobile GmbH. Michael Lohscheller has been at the helm of the tradition-rich automaker Opel since June 2017. Since September 2012, he was responsible for the automaker’s finances. Opel Post: What is PACE! changing in the other areas of operation? 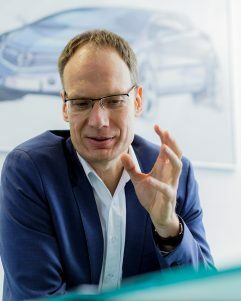 Lohscheller: We have fundamentally reorganised purchasing within the group in order to achieve economies of scale together with the other Groupe PSA brands – there is enormous potential for savings here. This is not just about the cars. We’ve been able improve the efficiency of our marketing expenses by €20 million just by merging the purchase of advertising space. We are looking at the fixed costs in every area and have already achieved a reduction of 17 percent. We are also looking at management positions and have already reduced the number of them by around 25 per cent. As you can see, the plan is working at all levels. Opel Post: All these measures are just about savings. Is this what a strategic plan for a sustainable future looks like? Lohscheller: PACE! is by far the most visionary plan we’ve had for Opel since what seems like an eternity! Take the subject of CO2 and the low fleet consumption stipulated for 2020 by the EU. Under GM we would have had to pay huge fines here because we were simply not CO2-ready! Now within Groupe PSA we will meet the targets in low CO2 emissions! We will offer an electrified version within each new model range. Opel goes electric – thanks to PACE! We’re starting off with the new all-electric Corsa and the plug-in hybrid Grandland X. And PACE! obviously also includes our ongoing model offensive. I already mentioned the new Corsa that will revitalize our business in the small car segment. But we also have additional hugely important models waiting in the wings. The next new model to be launched is the Opel Combo. Without saying too much, I can confirm that order books for the Life variant will open very soon. And then we have the new Vivaro based on the EMP2 platform, too. As you can see, PACE! is much more than a cost-saving plan. Opel Post: Back from the near future to today – how can PACE! help to increase our revenues? Lohscheller: We are now committed to the principle that we only do business that really pays off. That’s why we are also changing our dealer contracts. Both the dealer and manufacturer have to benefit from the business equally. We terminated the old contracts punctually at the end of April and plan to sign the new ones as soon as possible. This creates a stronger performance culture. This will pay off for our performance-oriented dealers and enhance customer satisfaction. In addition, we are massively strengthening our export business – as it never would have been possible under the GM umbrella. Opel Post: In what way? Lohscheller: The new company opens up completely new possibilities and we can take advantage of existing Groupe PSA structures. We have already reorganised our business in South Africa, Morocco, Tunisia and Lebanon. And already this year, Opel models will be assembled in a new Groupe PSA plant in Namibia. Assembly in Namibia will significantly help us to further strengthen our presence in Southern Africa. As you can see, our export offensive in markets outside of Europe is gaining momentum. And that is just the start. PACE! includes doubling overseas sales by 2020. We will enter new, profitable export markets by 2022. The goal: by the middle of the coming decade, more than ten per cent of Opel’s sales volume should result from business outside of Europe. Performance of our European plants is even more important especially when it comes to exporting cars overseas. Opel Post: Then there is also a very important business for every manufacturer – the captive bank, which offers our customers leasing and financing solutions. What is new here? Lohscheller: Opel Vauxhall Finance also has a strategic plan that perfectly complements PACE!. Just one example: to foster growth in the financially attractive commercial vehicle business, Opel Vauxhall Finance already plans to offer full-service leasing for fleet customers in Germany this year through Opel Bank. 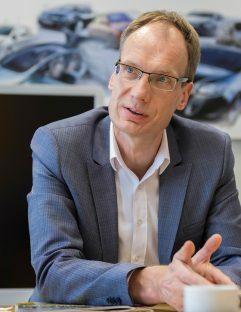 Opel Post: What role does the research and development centre in Rüsselsheim play in all these plans and measures? Lohscheller: Opel is and remains a German brand and stands for German engineering. We will also develop each of our new vehicles for our discerning European customers in Rüsselsheim – which was not always the case in GM’s day. This will help us improve technically and be more efficient: With the new technical possibilities within Groupe PSA, for example, our engineers were able to reduce the development costs for the next generation of the Corsa by more than 50 per cent. By more than half! So the Corsa will become a contributory car for us and from 2019 help us on our way to profitability. And it’s impossible to overstate the importance of the fact that responsibility for the development of light commercial vehicles (LCVs) is in Rüsselsheim, from advanced to series development – for the entire Groupe PSA. With this, we return to our roots – after all, the Opel Blitz is still a legend today. I am especially proud that our engineers here in Rüsselsheim will have responsibility for numerous technical areas for the entire group. We are currently establishing 15 Centres of Competence in Rüsselsheim, which bring typical Opel strengths to the Groupe PSA research and development network. The future of fuel cell technology will be shaped in Rüsselsheim. And that is just one example. Opel Post: What are the next steps you have planned? Lohscheller: We want to build a “New Opel” and finally put our losses and uncertainties behind us. We already made a commitment to be profitable by 2020, when we announced PACE!. When we are competitive again, we also ensure our sustainability. Therefore our most important goal is achieving competitiveness in Germany, too. Why should we fail to do this in Germany, our home country? Competitive plants in Germany – this would contribute to enhancing the utilisation rate of our German plants and lead to more cars being built here in the mid-term. These can be cars from any brand within Groupe PSA such as the Citroën models already being produced in Zaragoza or the Peugeot 3008, which is made in Sochaux alongside the Opel Grandland X. There is no other choice than to be competitive and we want to do this without forced redundancies and without plant closures. We made this clear on November 9 when we presented the PACE! plan. And of course this still applies today.